The villa is modern and spacious with amazing panoramic views over the ocean and city. Take a dip in the infinity pool, enjoy the sun set over the ocean, drink right temperate wines from wine refrigerator and cook food in the fully equipped kitchen. 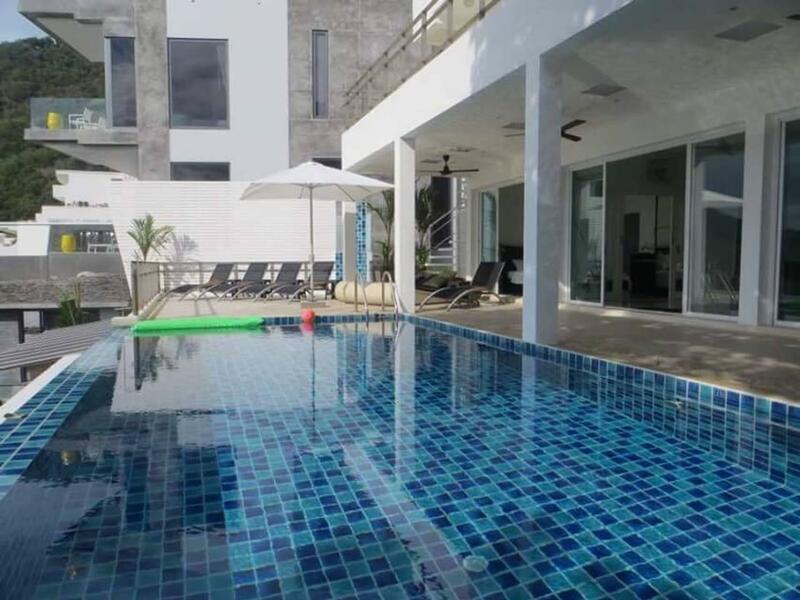 Many extras are in this modern villa in Kata, Phuket, Thailand. 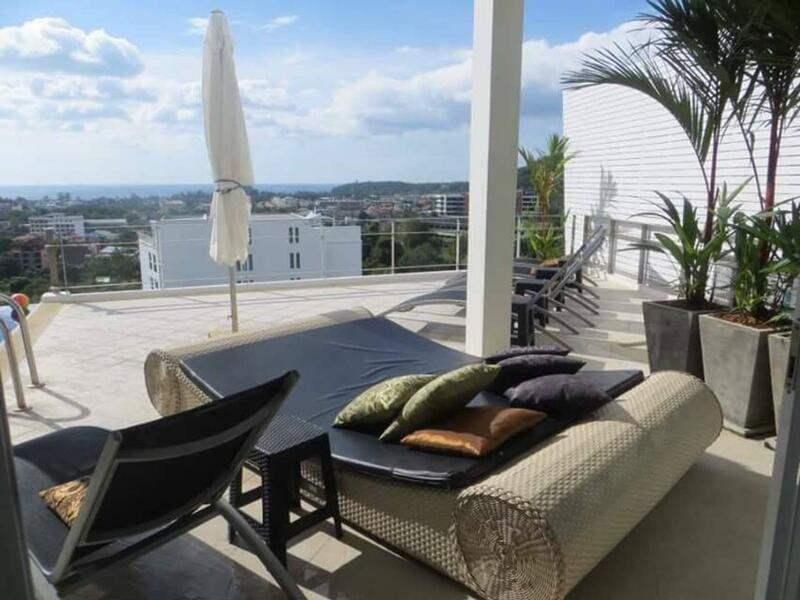 Here you can enjoy panoramic views over the city, the ocean and the tropical jungle, take a dip in the infinity pool and jacuzzi, see movies on home theater equipment with projector and surround sound system, drink right temperate wines from the wine refrigerator and cook food in the fully equipped European kitchen. The villa is perfect for larger families, group of friends or colleagues travelling together and want luxury and a great holiday at reasonable price. What makes the villa so amazing is the modern design and tasteful decor, grand spaces and carefully designed floor plans, the large glass sections that permeates the whole house and provide plenty of natural light and of course the stunning panoramic views. Villa Ginborn is a private own property and set over two levels with open floor plan of approximately 300 sqm living area, 200 sqm terrace, private swimming pool, five bedrooms (10-12 beds) with ensuite bathrooms, one guest toilet, cinema area, laundry, wireless internet and Satellite-tv. A welcoming open floor plan lounge area with large glass sections, breathtaking views and infinity pool faces you when you step into the very tastefully furnished villa. Within the open floor plan you will find the modern kitchen, dining and living room rolled into one. At this level there are also two bedrooms with king size beds, Tv and ensuite bathrooms, a guest toilet, laundry and safe. The ultra modern European kitchen is in U-shape and has a breakfast bar that is used for informal dining. The kitchen is equipped with fridge / freezer, hob, circotherm oven, microwave, dishwasher,wine cooler, blender, toaster, coffee maker, etc. Outside you find the large terrace with 32 sqm infinity pool, jacuzzi, outdoor shower, a dining area and modern sun beds. The terrace and pool invites you to many beautiful moments in the sun and in the evening you can enjoy the incredible sunset that nose dives into the ocean. On the upper level there are three bedrooms with king size beds / twin beds and ensuite bathroom. On this level you also find the cinema area with home cinema system. After a day on the beach its really nice to relax with a good movie shown on the huge screen and hear the surround sound from the speakers. The master bedroom has a king size bed, Tv, Dvd, safe, ensuite bathroom with double sinks and indoor jacuzzi. The other two bedrooms have a king size bed and two twin beds. These two bedrooms have Tv, Dvd, ensuite bathroom and connecting door between them which makes them suitable for a family. All rooms have the spectacular views and direct access to terraces/balcony. All bedrooms have ensuite bathrooms and air condition. There is the possibility to rent one more bedroom (six bedroom in total,guests) subject to availability, to an additional cost. Please contact us for a quotation. The listed prices are applicable for up to 10 guests, 5 bedroom. We are to our guests assistance when needed. Our main priority is that our guests have a wonderful stay and enjoy their holiday. The villa is located in a newly built residential area close to Kata Center. 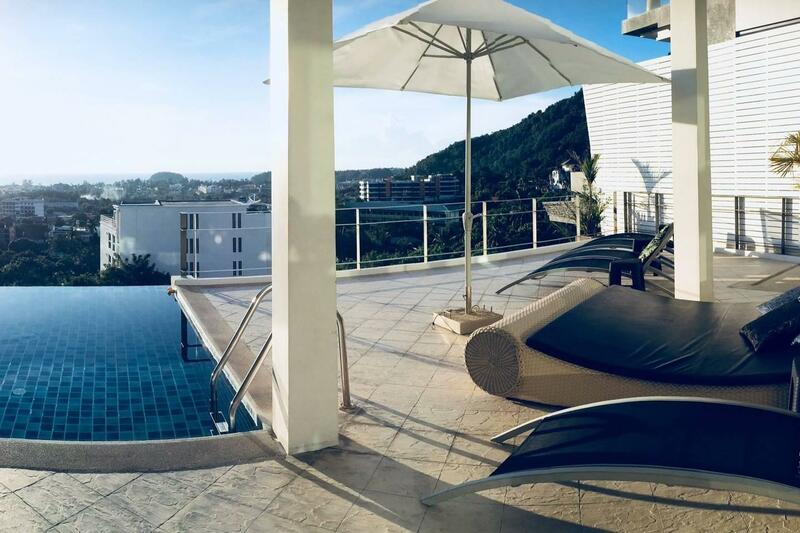 Within walking distance is one of Phuket's finest beaches - Kata beach that is highly regarded for being a quiet location but still with upscale restaurants, bars and small boutique shopping. Also on walking distance you have grocery stores, restaurants, hairdressers, laundry, massage, etc. Just 20 minutes to Patong and 5 minutes to Chalong this is a great location in the southern area of the west coast. The pleasant bay of Kata, just a few minutes south of Karon Beach, entices and charms many visitors with its white sands and clear waters. Very popular with families, Kata is an all round favorite due to its spectacular palm-lined beach, great restaurants, lively but not raucous nightlife and varied accommodation options - all close to the beach. From May to October surfers flock to catch Kata's waves and from November to April the beach is alive with sun seekers. Kata is split into two focal areas: Kata Centre, which is at the northern end close to Karon and Kata South, home to several resorts. Visitors will find an abundance of shops to browse in, from souvenir and ready-to-wear outlets, to 7-Elevens and local mini-marts, to name-brand fashion stores. Cleaning and change of bed linen during the stay is not included but can be arranged to an additional cost. By late check-in, after 20:00, the Tenants will be charge 1,000 Baht, after 24:00 an additional cost of 1,000 Baht (total 2,000 Baht). Late check out (according to occupancies) will be available from 11:00 on the check out day for an extra fee. * Security deposit: USD 1279.00-After completing the reservation the security deposit amount will be blocked in your credit card.